It was fitting that the sun finally shown brightly today, not that there needed to be any extra warmth at the third anniversary of Cafe Zoe, the Willows neighborhood coffee house that’s been a hub of community since it first opened. 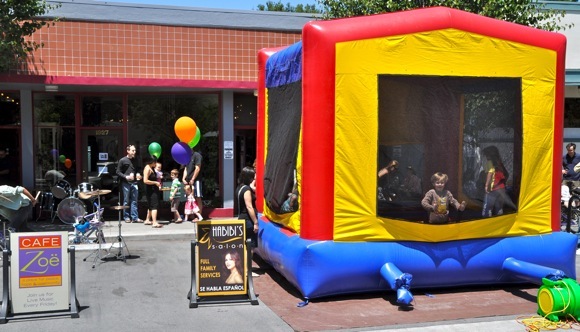 Owner Kathleen Daly, namesake/daughter Zoe, and all the staff were on hand to take part in the festivities, which included a bounce house, delicious sandwiches, and performance by a pick up band of Zoe regulars, which included Chris Stone, Scott Graves and Herb Atkins as well as Zoe employee Sean Graves (on drums). 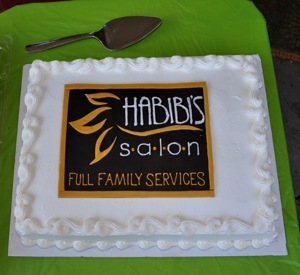 This year’s party was a co-celebration with Menalto Station neighbor Habibi’s Salon, which was marking its first anniversary. Note: Cafe Zoe isn’t just a place for coffee and relaxation. Tomorrow night, June 13, it will be hosting a neighborhood meeting to discuss how to save Flood Park. I can barely count the numbers of locals who call this their very own “second home”. This morning, there must have been 5 moms and even a couple of accompanying husbands having coffee at Zoe’s, spilling out over the sidewalk, when they ALL should have either been off shopping at Costco, volunteering, or working out. It truly is the happy little hub of our “village”. Big thanks to owner Kathleen Daly and all of her fabulous people, with their happy demeanor, great coffee and food, tremendous music and warmth. 6 stars.